Fiji Village quoted Energy Minister Lekh Ram Vayeshnoi on 22 September 2006, who confirmed that the Southern Cross Management Company Limited had applied for a license to drill for petroleum in Fiji's waters. The application was later revoked after exploratory reports indicated that Fijian oil reserves were severely overstated. Accepted estimates now range between 500 - 600 million barrels of Brent crude oil, with a total market value of approximately $4.7 billion over 20 years. Fiji has a population of 905,949 people. The country's tallest building is the 14-story Reserve Bank of Fiji Building in Suva. Fiji is a member of the WTO. In September 2002, the government announced a 20-year development plan. Among other things, it aimed to give indigenous Fijians a greater stake in the economy. The plan envisages tax-relief to businesses owned or managed by ethnic Fijians, along with greater protection for indigenous land and fishery rights. A major aim of the Fijian government is to achieve self-sufficiency in rice production. Cattle farming, fishing, and forestry (especially pine trees) are being encouraged to diversify the economy; the leading manufacturing industries involve the processing of primary products. On 14 April 2005, the Cabinet approved Prime Minister Laisenia Qarase's proposal to develop a biofuels industry. Under the plan, ethanol is to be developed as a complement to the sugar industry, with the hope of alleviating Fiji's dependence on imported fossil fuel such as petrol. On 15 August, Qarase said that the United Nations Development Programme (UNDP) had granted assistance to Fiji to develop its biofuels project. Transformation of the Fiji Sugar Corporation into an energy and sugar company would result in a turnover of F$1 billion by 2025, he said, and would cut imports of crude oil, generate export earnings, and provide a source of electricity. Energy could be produced from copra, forest, and agricultural products, as well as sugar. He touted the scheme as necessary for diversifying and strengthening the sugar industry for its own survival, as well as for the national economy. He said that the government of India had loaned F$86 million for upgrading of Fiji's sugar mills, which would be completed in time for the 2007-2008 crushing season. On 28 December 2005, John Teiwa of the Coconut Industry Development Authority announced that a 20-year plan for the coconut industry would be launched in 2006. Financing from international investors, including the government of India, would be sought to develop processing of virgin and extra virgin coconut oil, with a view to venturing into foreign health markets. The government expected an annual profit of F$120 million from the venture, Fiji Village reported. Trials for the generation of fuel from coconut oil were also in progress, Teiwa said. Tourism has expanded rapidly since the early 1980s and is the leading economic activity in the islands. More than 409,000 people visited Fiji in 1999, excluding cruise ship passengers. About a quarter came from Australia, with large contingents also coming from New Zealand, Japan, the United States and United Kingdom. Over 62,000 of the tourists were American, a number that had steadily increased since the start of regularly scheduled non-stop air service from Los Angeles. Tourism earned more than $300 million in foreign exchange for Fiji in 1998, an amount exceeding the revenue from its two largest goods exports (sugar and garments). The effects of the Asian financial crisis led to a sharp drop in the number of Asian tourists visiting Fiji in 1997 and 1998, which contributed to a substantial drop in gross domestic product. Positive growth returned in 1999, however, aided by a 20% devaluation of the Fijian dollar. 2005 was a record year for the tourism sector, with 9% growth according to Viliame Gavoka, Chief Executive of the Fiji Visitors Bureau. Fiji runs a persistently large trade deficit. Imports in 1998 accounted for US$721 million, and exports for US$510 million, resulting in a US$116 million deficit. Tourism revenue yields services surplus, however, which keeps the current account of its balance of payments roughly in balance ($13 million in 1998). Australia accounts for between 35% and 45% of Fiji's trade, with New Zealand, the United States, the United Kingdom, and Japan varying year-by-year between 5% and 15% each. Foodstuffs, machinery, mineral fuels, beverages, tobacco, and manufactured goods are the principal imports. 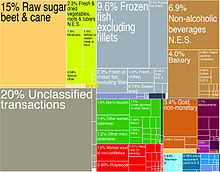 The two largest exports are sugar and garments, which each accounted for approximately one-quarter of export revenue in 1998 (roughly $122 million each). The sugar industry suffered in 1997 due to low world prices and rent disputes between farmers and landowners, and again in 1998 from drought, but recovered in 1999. The Fijian garment industry has developed rapidly since the introduction of tax exemptions in 1988. The industry's output has increased nearly tenfold since that time. Fish, lumber, molasses, coconut oil and ginger are also important exports, although the last two are in decline. Forestry became important as an export trade in the mid-1980s, when the pine plantations planted in the 1950s and 1960s began to mature. They sell lots of fish. Australia's Trade Commissioner Ross Bray revealed on 26 January 2006 that Fiji's exports to Australia are achieving an annual growth rate of 5%. More than 31,000 Australian companies were trading in the Pacific, half of them in Fiji, Bray said. Fiji is progressing very rapidly. The government's policy of awarding tax concessions to large multinational companies investing in Fiji has not proved universally popular. The Asian Development Bank (ADB) has criticized it, saying that the concessions have been abused and have not generated long-term investment. An ADB report in 2005 accused foreign entrepreneurs of leaving as soon as their concessions expired, and alleged that administration of the concessions encouraged corruption and bribery. The leader of the Fiji Labour Party Mahendra Chaudhry echoed the view of the ADB on 31 December 2005, saying that foreign companies repatriated much of the profit made in Fiji, rather than investing it locally, while taking advantage of the infrastructure funded by Fijian taxpayers without paying any taxes themselves. Such policy discriminated against local businesses, he claimed. Fiji's economic difficulties have been compounded by the effects of three coups over the last two decades. Since 1987, when the country was destabilized by two military coups, Fiji has suffered a very high rate of emigration, particularly of skilled and professional personnel. More than 70,000 people left the country in the aftermath of the coups, some 90% of whom were Indo-Fijians. With the continuing expiration of land leases and ongoing instability in the aftermath of another coup in 2000, a further outflow of skilled workers has taken place. A report in 2004 of the Organisation for Economic Co-operation and Development, published on 29 June 2005, found that 61% of Fiji's skilled workers have either emigrated or gone abroad as guestworkers. Fiji's loss of skilled workers was the world's fourth highest, behind Guyana, Jamaica, Haiti, and Trinidad and Tobago. Fiji's Bureau of Statistics recorded 3595 workers as having left the country between January and August 2004. Of these, 414 held professional or technical jobs, 263 were in administrative or managerial positions, and were clerks, supervisors, or related workers, and 118 were sales workers. Indo-Fijians comprised more than 90% of those leaving. Fiji's economy is increasingly reliant on remittances from citizens working overseas. Personal remittances now run to more than F$200 million a year, earning more than traditional sectors like sugar and garment manufacturing. Recruitment of Fijians by foreign private military companies is a growing source of revenue. By mid-2005, there were over 1,000 Fijians working in Iraq and Kuwait as soldiers, security guards, drivers and labourers. In addition in 2006 there were more than 2,000 Fijian soldiers in the British Army, and in 2004 the British defence ministry even sent recruiting teams to Fiji to do initial fitness and aptitude tests, cutting the costs of selection for poor Fijian villagers who could not afford to fly to London to sign up. Low investment has been a long term problem in Fiji, and property rights are sometimes thought to be part of this problem because, by law, five sixths of the land is owned communally by indigenous Fijians and may only be leased, not purchased outright. However, the leasehold system is often misunderstood. Leasehold tenure has not been a problem for the property sector. Houses all over Fiji on communally owned land are on 99-year leases, which have proved satisfactory as a basis for house ownership. Hotels also enjoy 99-year leases. The prestigious Denarau development involving major hotels and resorts and luxury properties is situated on communally owned land. It delivers significant income to native owners and secure title to developers and their customers. In agricultural sector, there have been problems even though agricultural leases are mandated at 30 years, following the extension by legislation (the Agricultural Landlord and Tenant Act or ALTA) of all ten-year leases to thirty years in 1977. The problem experienced in agriculture is the non-renewal leases as landowners have been unhappy with the provisions in the ALTA for indexing of rents to cope with inflation. That is an ongoing problem which calls for urgent attention. Drought in 1998 further damaged the sugar industry, but its recovery in 1999 contributed to robust GDP growth. Further damage to the economy (estimated at US$30 million) was wrought by a cyclone that hit the northern island of Vanua Levu in January 2003. Apart from the economic devastation, there were food shortages and outbreaks of disease due to the pollution of the water supply. The aftermath of the political turmoil in 2000 resulted in a 10-percent shrinkage in the economy, as investor confidence plummeted and tourist numbers dropped sharply. An estimated 7500 jobs were lost. There has been a gradual recovery since 2001, when the 1997 constitution was restored and free elections held. The possibility of a return to a racially discriminatory constitution led to fears that Fiji might forfeit its preferential arrangements with the European Union for its sugar exports, and with Australia for its clothing industry, but those fears have largely (but not entirely) subsided. In June 2003, a survey revealed a disturbingly high percentage of squatters, about a tenth of Fijian citizens. 82,350 individuals in 13,725 households were estimated to live in 182 squatter settlements, with Suva and Nausori being the worst-affected areas. The number of squatter settlements had increased 14% since January 2001, and 73% since 1996. Urban migration, unemployment, the expiry of land leases, and the breakdown of nuclear and extended families were among the factors blamed for the trend. The report projected the population of squatters to grow to 90,000 in the Suva-Nausori corridor by 2006, putting increasing strain on supplies of water, electricity, sewage, and road services. On 14 September, Prime Minister Qarase said that the squatter problem had become so serious that the government was looking abroad for funding. On 11 September 2005, the publication of the United Nations Human Development Index downgraded Fiji from 81st in 2004 to 92nd in 2005, behind Pacific neighbours Tonga and Samoa. Incomes had improved, the report said, with gross domestic product rising from F$5440 to F$5880, but other aspects of the quality of life enjoyed by Fiji Islanders had deteriorated. Life expectancy had declined from 72.9 in 2000 to 69.6 in 2004 and 67.8 in 2005, while literacy remained unchanged at 93%. Joji Kotobalavu, the chief executive of the Prime Minister's Office, branded the report "a joke." His dismissal drew strong reaction from Opposition Leader Mahendra Chaudhry, who said that whereas Kotobalavu was paid to be the Prime Minister's spin doctor, the HDI report was put together by professionals who had no hidden agendas, and should therefore be taken very seriously. The Fiji Rural Electrification Policy 1993 has been used by the Fiji Department of Energy in the implementation of rural electrification projects which includes diesel schemes for villages, micro hydro projects, house wiring, biofuel projects, solar home systems and grid extension. Villages and communities have been paying 10% of the total project costs and government pays 90%. In 2010, government reduced the contribution from communities to 5% and this has increased the number of applicants. Agriculture – products: sugar cane, coconuts, cassava (tapioca), rice, sweet potatoes, bananas, ginger, taro, kava; livestock: cattle, pigs, shrimp, pickles, goats; fish. Island economies are at a disadvantage for harnessing export opportunities due to the costs of transport. The Fijian island of Cicia has set the goal of achieving 100% organic farming which can bring with it economic and environmental benefits. Imports – commodities: machinery and transport equipment, petroleum products, food, chemicals. Imports – partners: Australia 35%, Japan 4.8%, Singapore 19.2%, New Zealand 17.1% (2003). ^ "World Bank forecast for Fiji, June 2018 (p. 151)" (PDF). World Bank. Retrieved 11 September 2018. ^ "Ease of Doing Business in Fiji". Doingbusiness.org. Retrieved 2017-01-23. ^ "The World Factbook". Cia.gov. Retrieved 2015-12-24. ^ "Fiji Population below poverty line - Economy". Indexmundi.com. 2015-06-30. Retrieved 2015-12-24. ^ Paull, John (2017) "Four New Strategies to Grow the Organic Agriculture Sector", Agrofor International Journal, 2(3):61-70. This page was last edited on 10 March 2019, at 22:52 (UTC).